Thursday, Sept. 11, 2008: Kelly Slater wins the 2008 Boost Mobile Pro of Surfing over Taj Burrow in one of the most exciting 40 minute heats in Pro Surfing history. The waves were good and the surfing was phenomenal. Taj took the early lead posting a 9.00 and a 9.63 in the first ten minutes putting Kelly in a combination of two scores situation. With priority, Taj was holding Kelly off any of the big sets which enabled Kelly to take off on a few medium size waves and absolutley destroy them. He was able to score a 9.70 and a then a 9.27 with less than one minute left in the heat to take the lead and the win. Stay tuned for the complete story and highlight video. Boost Mobile Pro Lower Trestles 2008 Top Ten Waves! Tuesday, Sept. 9, 2008: The world’s best surfers took to the skies at the Boost Mobile Pro at Lower Trestles today. World No. 2 Joel Parkinson (AUS) and ASP World Tour rookies Dane Reynolds (USA) and Jordy Smith (ZAF) are one step closer to vying for a Boost Mobile Pro title courtesy of the airs they boosted today. Monday, Sept. 8, 2008: The world’s best surfers were treated to perfect conditions at the Boost Mobile Pro presented by Hurley today. All of Round 1 and the first two heats of Round 2 were run in consistent three to five foot waves at Lower Trestles. Having the opportunity to score another surf in today’s excellent conditions was not lost on ASP World No. 3 Bede Durbidge (AUS) and World No.4 Taj Burrow (AUS). Both surfers came up short in Round 1, but bounced back in Round 2 beating former ASP World Tour competitors Shane Beschen (USA) and Rob Machado (USA) respectively to avoid an untimely exit from the event. Friday, Sept. 5, 2008: Despite being a rookie on the ASP World Tour, Dane Reynolds (USA), 22, will paddle out for his fifth installment of the Boost Mobile Pro presented by Hurley this week. The event waiting period begins this Sunday, Sept. 7 and stretches until Saturday, Sept. 13, 2008. Dane Reynolds, who hails from Ventura, California, was granted wildcard entry into the Lower Trestles event in 2003, 2004, 2006 and 2007 and will face Jeremy Flores (FRA), 20, and Heitor Alves (BRA), 26, in his first USA appearance since joining the elite ASP Top 45. 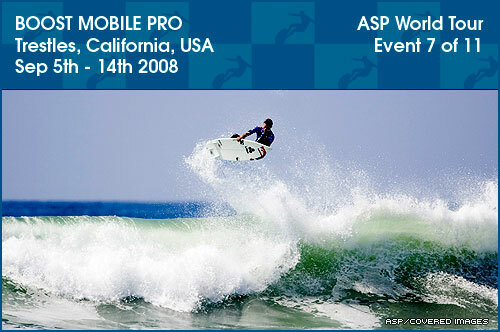 Thursday, Sept. 28, 2008: The upcoming Boost Mobile Pro presented by Hurley may be the closest thing eight-time ASP World Champion and ratings leader Kelly Slater (USA) has to a home court advantage on the ASP World Tour. Held at Lower Trestles in San Clemente, California from September 7-13, 2008, the seventh of 11 events on this year’s ASP World Tour is the only elite tour stop in the continental U.S.A. – Slater hails from Florida. TRANSPORTATION: Rental car. Enjoy the sights and sounds of the 405 freeway as you make the trek down to San Clemente. Once in San Clemente, you’ll want to drive down to the event site, but taxis are more than available when sampling the downtown nightlife. ATTITUDE: Generally laid back, though the locals have yet to embrace that whole "sharing is caring" mentality – but who can blame them? If the best break in mainland USA was in your backyard, you’d probably get a little possessive too! THE WAVE: This high-performance pointbreak peels across a rocky coastline and can pump up to 150 metres down the point when a south or southwest swell shows up. The left is a quicker, hollower, punchier wave, while the right is a longer, more even-paced beauty ready to be released upon with aggressive and unforgiving gusto. Both boast the ability to make even an average surfer appear gifted. PERKS: This wave is consistent – Trestles has been known to break when the rest of SoCal is dead flat. And lest we forget, this little stretch of sand that spans the North County and Orange County border is likely to be the only place within a 200 kilometre radius where it’ll take you more than 10-minutes to walk to a Starbucks or Vietnamese nail salon - which means you’re more likely to get attacked by a bobcat than an over-caffeinated chick with long fingernails. PERILS: It’s best to grow to love the 20-to-30 minute trek – you have to undertake between parking and paddling out – as the plans to install a 1.5 kilometre walking carpet from the Carl’s Jr. parking lot to the surf aren’t looking promising. Oh, and terrorists steer clear, the US Marines have you surrounded. Trestles sits smack in the middle of Camp Pendleton – one of the Yank’s largest military bases. APRES SURF: Pick your poison; you’re mere miles away from San Clemente, home of the fabled San Clemente Crawl: aka a Bermuda Triangle of dive bars, and smack between Mexico and Hollywood. Orange County splays north and there’s always San Diego to the south – translation, if you strike out at one bar, there’s approximately 11,964 others at your disposal. ASP WORLD TOUR HISTORY: Trestles, the only men’s ASP World Tour event on mainland USA, made its debut in 2000 as the Billabong Pro won by Andy Irons. Boost Mobile came on board in 2002, and has sponsored the mid-season men’s event ever since. The 2006 BMP of Surf will be the cell phone company’s fifth foray as headlining sponsor… Hurley is the presenting sponsor of the Boost Mobile Pro at Trestles. NOTABLE: Kelly Slater shattered Tom Curren’s record 33 career event wins in 2007 with his victory at the Boost Mobile Pro, netting the eight-time ASP World Champ 34 career victories. Oct 30-Nov. 10 - Somewhere?